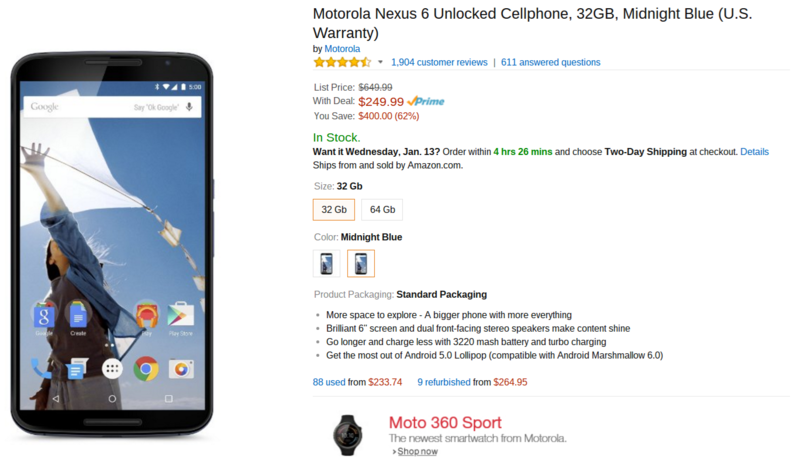 The Nexus 6 is available on Amazon for $249.99/$299.99 for the 32GB and 64GB models respectively. This isn't a new deal, or a better price than what we posted a couple of weeks ago at the end of December, but the phone has been out of stock for the past several days. I'm sure most of you have the Nexus 6's specs memorized by now, so I won't go into detail telling you about the device. Summary– it's a great big phone for a pretty small price that will give you access to lighting quick Android updates. Both dark blue and white models are in stock, and as this is the US model, it is compatible with every major carrier in the US, just pop in the SIM card of your choosing. Inventory is limited, and I doubt they will be making many more of these now that new Nexus devices are on the market, so act fast if you want to grab one for yourself.